Chicago prom season is a busy one for transportation companies! Are you helping your child plan out their prom in Chicago? There are a lot of different things to consider when planning the perfect prom experience. Senior prom only happens once, after all! It's a time that teenagers look forward to for their entire high school experience. Dressing up, finding the right date and outfit, and planning festivities with their group of friends will make for long lasting positive memories. 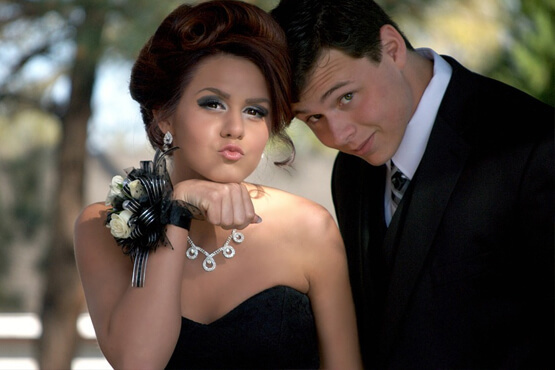 As a parent, you naturally want to provide the best possible prom experience for your children. However, it's likely that you're pretty worn out from random expenses through out the school year, especially if your child is involved with extra curriculars. If you're on a budget, you might think that reserving professional transportation for prom is out of the question. Don't worry, though! There are some easy measures to take to ensure you're getting the best possible deal on a prom bus rental Chicago. We are here to tell you why transportation is a great investment for a prom experience. Teens love the atmosphere of Chicago party buses. The neon lighting and updated stereo systems allow them to customize the environment of the trip. They love to take lots of pictures and show off their sweet ride on Instagram and Snapchat. Plus, it's a lot cooler to them than your mini van or SUV! When you're looking for professional transportation, be sure to ask companies if there are any special packages for prom. Also, consider splitting up the entire cost with all of the teenagers who will be on board. This will make for a pretty affordable price per person! The benefits of a prom bus rental Chicago go further beyond enticing interiors and bumping tunes. When you go with a professional transportation company, you know that your child is in the best possible hands. Any alterations to the itinerary have to be approved by you, so you will never have to worry about where they are, or what they're doing. Teens can get pretty distracted behind the wheel during this exciting time, and it's always safer for them to be with a trusted chauffeur than an inexperienced teenager. When you consider that this is something that benefits the safety of your loved one and their overall enjoyment at their prom, you can see why a prom bus rental Chicago is an excellent idea. Like we said before, the transportation industry gets extremely busy during Chicago prom season. If you do want to make sure the right vehicle is available for your group of teenagers, be sure to book as early as you can. If you book early enough, you might even be able to get a special discount! After all is said and done, you will be so happy that you went the extra mile for this once in a lifetime experience in your child's life. We are always here to answer your questions about booking, so get in touch!